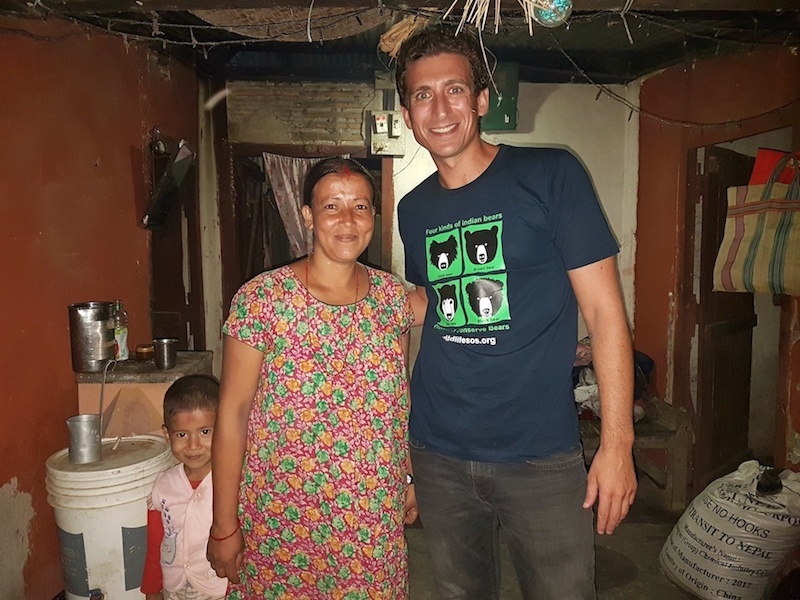 How could I turn down an offer to visit a remote village in Nepal? After all, I’ve known my friend Bhudiman for over 5 years. When I first started organizing tours to India back in 2012, I was connected to Bhudiman through a mutual friend and he instantly became my most trusted driver for these group trips. Not only that, despite his limited English and my limited Hindi and Nepali, we became quick friends. Bhudiman has now been the main driver for all of the tours that I’ve led to India and my tours would not be the same without him. And while he’s lived in India for over 20 years, he’s originally from Nepal, which he travels back and forth to several times per year in order to spend time with his family. He has always invited me to join him in his home village too, but I usually couldn’t fit it into my schedule. So, after a few years of this, Bhudiman put his foot down this year and basically demanded that I visit his home. To make this trip happen, Bhudiman and I flew from Delhi to Bagdogra, a small town on the opposite side of India. From there we took a bus, followed by a taxi, until we reached the simple border crossing at the town of Kakarbhitta. The Nepali immigration office there consisted of a small, unmanned desk in a dark room. I eventually found an immigration officer out back, I handed over the $25 USD fee and received a 2-week visa in my passport. We then took another bus and another taxi until we eventually arrived at Bhudiman’s village, Asculchon, in the Jhapa region of the country. I actually can’t even find anything at all about it online. I’m not even sure if Bhudiman is 100% certain that this is the name of his village! As you can see, I enjoyed two full days of hanging out with Bhudiman and his family, meeting his brothers and sisters, visiting markets and schools and friends’ homes, riding a motorbike through the countryside, eating wonderful home-cooked food, chatting late into the night, walking through the rice fields, having a drink at the local bar, throwing down dozens of cups of chai, taking bucket showers in the very simple outhouse and basically having such a unique experience that it can barely be put into words. It really was beyond memorable. Also, Bhudi and his family are always happy to have visitors so if you ever want to visit this village in Nepal too, let me know and we can try to make it happen! Have you ever been to a remote village? How was your experience? Is this kind of travel for you? This question is a bit late but I always wonder when I read about you. I’m nowhere near the experienced traveler as you… been living in Asia for quite some time doing the ESL thing. But my only true spoken language is English. I heard this question about language on one of your India videos. Surely you speak bits of many different languages…. as you said Hindi… Nepali etc. How many languages do you speak? As in how many can you converse in or speak in a somewhat fluent manner. Maybe Spanish you mentioned that you have lived in Playa del Carmen. Thanks. Always so interesting to read about your travels and interactions with others. I agree with you its certainly more about the people that you meet and interact with rather then the place you visit and the sights that you see. Hey Jake – That’s a good question. To be honest, Spanish is really the only language that I can converse in other than English. Apart from that, Romanian would be my next best but it’s still quite basic. And then, like you mentioned, I have learned bits of several other languages along the way. The problem is practice. When you move around all the time, it’s difficult to practice a particular language and so the real progress never happens. I just wanted to say that your blog truly fascinates me! All those stories about your adventures to all those places are always full of interesting and fun surprises. I’m still in school right now, but once I graduate, I will be sure to try to travel as much as possible. It’s amazing what different parts of the world look like and how different peoples’ lives can be. At the moment, I’ve been to eight different countries, nothing compared to the 103 countries you’ve been to. I hope that I would get to that point one day though! Hey Andy – We all start somewhere so 8 countries is nothing to look down upon! Stay motivated and that number will increase too, and more importantly, the rewarding experiences will increase as well! I, too, enjoyed watching your video about the remote village in Nepal. I found your blog on Normadic Matts blog site. I am planning to begin long-awaited courage to travel solo later this summer. So I am viewing as many travel blogs as I can … but have MADE A DECISION to just do it because there will never be the so-called “perfect time”. Hey Burcie – And that’s the most important step, just forcing yourself to do it. I can guarantee that the rest will be much easier!! Awesome! I never got an experience quite like this, but there were a few times in Nepal where my friends and I were the only guests at a guesthouse, which without fail led to great experiences and tons of lessons. I loved watching your video. What a lovely set of people! I’ve been to a few remote villages, but the ones that I remember most were either in Africa or Eastern Europe! My German boyfriend – now husband – and I, rented a taxi to take us to a Hill Station in Nigeria. The “taxi” was so jalopy that bits were falling apart, and at one point, we even had to push it! We passed through a little village, and a small child was so astonished to see my pale skinned husband, that he burst into tears! Hey Victoria – Ha, well done! Glad to hear you like to have some adventures! I love this style of vlog that you did to summarize your trip to Nepal. Such efficient use of your photos and video clips that took while you were there! Also enjoy your dry, sarcastic humour at some points (ie. the chicken in the living room). Hope you continue to make more of these on your travels where it makes sense! Wherever you go, whatever you see, nothing sticks with you like the human connections and relationships that you form. It is always wonderful to realize how people all over the world are hospitable. This is what it’s all about. This is what I miss the most about open ended travel. Thank you so so very much for sharing. Oh Earl- what an amazing opportunity and honor. I see your friend and his village are also very honored to meet the man that has blessed them! How great to hear the little girls all giggly and proud to practice their English with you. Pure innocence of true childhood! I admire you. You deliver your messages well, plain simply no exagération or hoopla- just truths! The best of my memories (of years ago) was visiting families. It’s the children where I found the honesty and balance of truth of a place. Very nice video. Watching it from the other side of the world feels as if one is traveling in space AND time.